The Campisi model was first proposed in a paper published by Stephen Campisi (Primer on Fixed Income Performance Attribution, Journal of Performance Measurement, June 2000). It is perhaps the simplest possible security-level model for fixed income attribution. Campisi's original paper describes income return as generated by coupons; specifically, as the average annual coupon divided by the average beginning market price. This is actually running yield, as it omits any pull-to-par effects. Treasury effect combines the returns from parallel and non-parallel curve movements into one source of return, given by . The change in treasury yield is given by the change in the treasury curve at the tenor point equal to the duration of the portfolio. Spread effect is the effect of changes in the average spread , given by . Treasury and spread durations are assumed to be equivalent. Selection, or security-specific, return is given by total return, minus the sum of the previous three effects. There is no residual term. Any unexplained returns is aggregated into selection effect. The Campisi model can be applied at the portfolio, sector or security levels. The duration model provides slightly more information than the Campisi model. 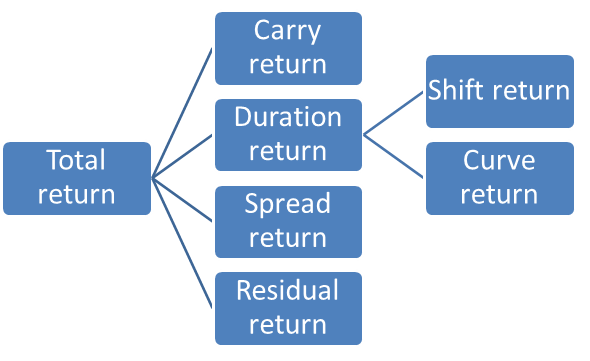 Treasury effects, which are returns generated by changes in the level of the sovereign curve, are decomposed into returns made by parallel movements in the curve (duration return), and those from non-parallel movements (curve return). Modified duration measures sensitivity to both types of yield movement, so this effect gives its name to the model. The definition of how parallel movements should be calculated varies widely. There is no formal definition of the duration model in the attribution literature, but it is one of the most widely used. 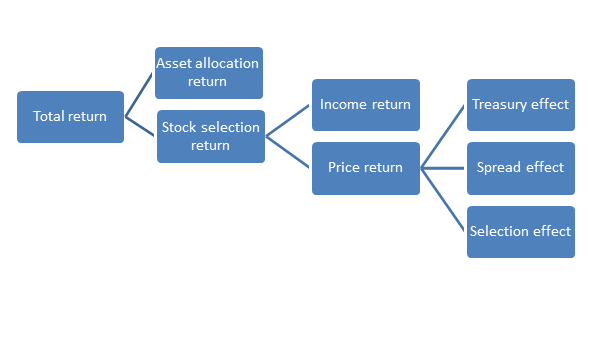 The Tim Lord model is similar to the Campisi and Duration models, but includes a number of more detailed effects ('The attribution of portfolio and index returns in fixed income, Journal of Performance Measurement, Fall 1997). 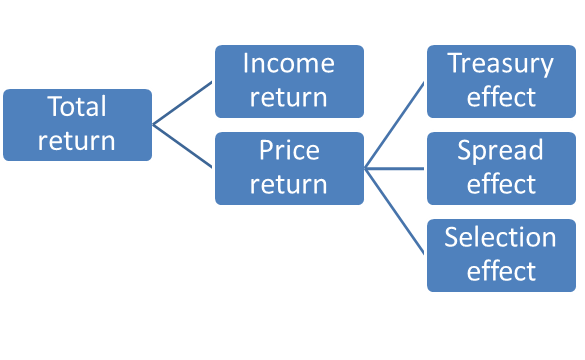 Income return is given by change in accrued interest and other income cash flows. As with the Campisi model, this is more correctly described as the return due to running yield. Unlike the Campisi model, pull-to-par and roll-down effects are measured here as calendar returns (see below). Duration return is defined as price return due to changes in the Treasury par curve, measured as the product of the negative modified duration of each security, times the change in yield of its duration matched Treasury (a synthetic Treasury bond with the same modified duration as the target bond). Shift return is generated by parallel shifts in the Treasury curve. The shift is measured at the 5-year maturity point on the curve. Twist return is the portion of return generated by non-parallel shifts in the Treasury curve. 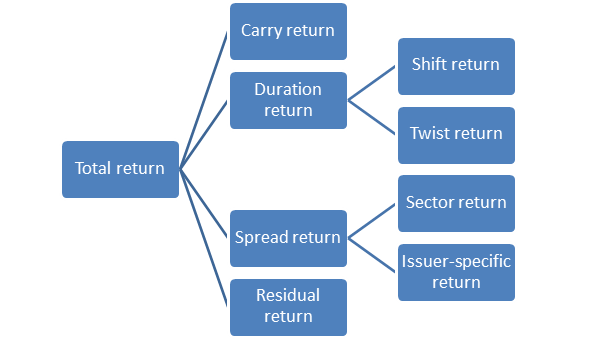 Spread return is further decomposed into sector return and issuer-specific return. Sector return is calculated by recording the change in spread for the security's defined sector, which is the average OAS change for all benchmark securities in that category. Issuer-specific return is the difference between spread return and sector return. 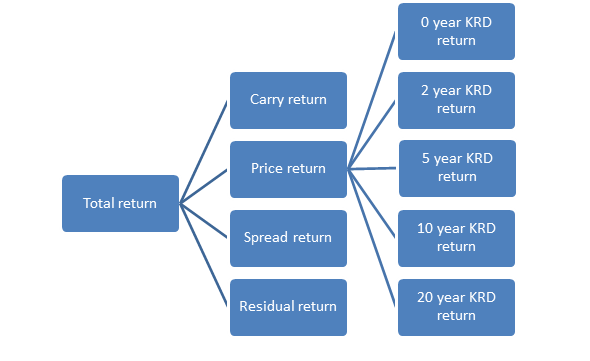 Residual return is the price return that is unexplained by the sum of the previous effects. The author notes that the model can generate substantial residuals if a security's pricing model is wrongly specified. However, this is easily addressed if the attribution system can use specialized pricing models, rather than a one-size-fits-all approach. Most security-based models are variants of the Tim Lord approach. In addition, assign a sector curve to each security where appropriate. Modified duration measures the sensitivity of price to changes in overall levels of interest rates. For instance, if the yield curve moves downwards by 10 basis points, a bond with a ten year modified duration will generate a return of 100 basis points, but a bond with a two year modified duration will generate only 20 basis points. A key rate duration measures the price sensitivity of a security to a change in its yield curve at a single maturity, rather than to movements in the curve as a whole. It is therefore suited to detailed analysis of the return of securities with cash flows spread over a range of maturities, such as amortizing bonds and MBS. Key rate duration attribution usually follows the same pattern as Campisi and Tim Lord models. The difference is that returns from changes in the yield curve are represented as returns from different maturities along the yield curve, rather than from global movements such as shift and twist. Top-down attribution forms a useful approach to attribution on fixed income portfolios where over- or under-weighting of sectors forms part of the investment process, in addition to taking fixed income investment decisions. Top-down attribution forms a combination of the successive portfolio methodology, of which Brinson attribution is the simplest example, and the successive spread methodology, which underlies the various models shown above. The approach is described in the GRAP paper 'Fixed income attribution: proposal of a new methodology' (Gillet and Homolle, undated). Unlike the other types of attribution model shown here, top-down attribution requires a benchmark, just as for the Brinson models. where and are the weights of the portfolio and benchmark sectors, and is the return of the sector in the benchmark. The typical user of this type of strategy has a two-fold investment strategy. Firstly, a decision is made about which sectors to overweight. For instance, if mortgage-backed debt looks attractive relative to Treasury bills, the former will be overweighted relative to the benchmark. Next, the managers for each type of asset will make a range of fixed-income specific investment decisions, and the value added by each will be calculated using the above expression. It is of course possible to run such an analysis on a portfolio containing a large number of different asset types even when no format asset allocation decision has been made. The results are arguably of little use, since they do not reflect the underlying investment process. The reader should beware of reverse fitted analyses, in which a range of attribution analyses have been run to cherry-pick the particular strategy that generated positive returns. This page was last modified on 30 May 2016, at 23:57. This page has been accessed 50,014 times.